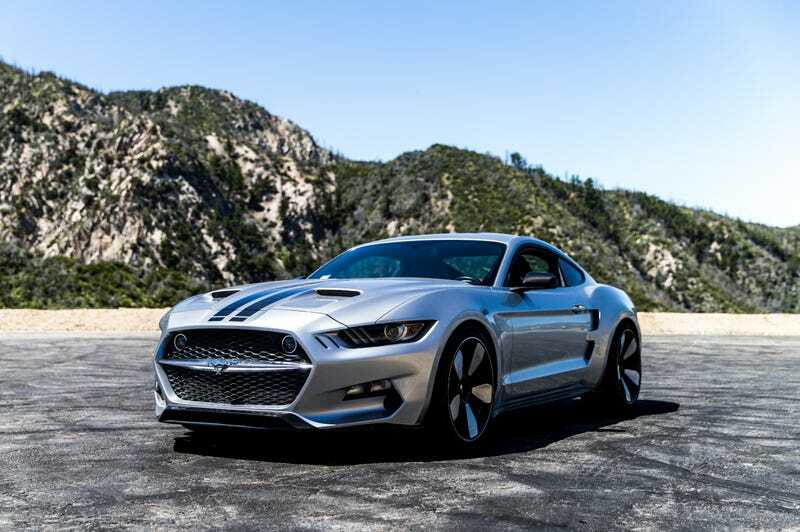 When you conceive a project that involves the design genius Henrik Fisker, the customization know-how of Galpin Auto Sports, and a car as iconic as the Ford Mustang GT, you’re off to a good start. Even more so when you add a 725 horsepower supercharged V8 engine. On paper, the VLF Rocket—driven heroically by Jeremy Clarkson in the very first opening scene of The Grand Tour—seems like it could be a legend in the making. What Do You Want To Know About The 725 HP Fisker-Designed VLF Rocket? In reality, however, it’s much less than the sum of its parts, and I can’t escape the feeling that if you want the ultimate Mustang, Ford already makes it. VLF Automotive was actually VL Automotive when it was founded in 2012, back when former General Motors super-exec and fighter jet enthusiast Bob Lutz teamed up with Gilbert Villarreal with the plan to go bonkers with Fisker Karma by dumping its hybrid powertrain in order to swap in the guts from the Corvette ZR1. Very mental, but very Jalop. Once Henrik Fisker—the man behind the BMW Z8, various Aston Martins and his own unfortunately ill-fated company—was aboard, the group went nuts designing the Karma-based Destino followed by the Dodge Viper-based Force 1 in 2016. The VLF Rocket V8 is the wild combination of a Ford Mustang, a body rebuilt with lighter carbon fiber, a massive Whipple supercharger slapped onto the 5.0-liter Coyote V8, and a more aggressive, fully-adjustable suspension package, plus much fatter wheels and tires. The 725 HP rating is paired with 700 lb-ft of torque, and that’s quite a lot for a Mustang. VLF claims it’ll bolt from 0-60 MPH in 3.5 seconds, on its way to a top speed of 200 mph. These numbers don’t come cheap, as I’m told the price for most of these will be right around $100,000. Wheels are now 21 inches, wrapped with 275/35 front and 325/30 rear Pirelli P-Zero tires. The standard Mustang GT Performance Pack wheels were 255/40 and 275/40 and 19 inches. The carbon fiber body shaved over 200 pounds off the original 3,700 pound curb weight. The noise from that blower and the exhaust notes it belts out are unearthly, and carry a throaty tone that will scare any pedestrian within several blocks. Any American performance car worth its weight should pack a big V8, and it can only be better when it has a Whipple blower bolted on top of that motor. Jumping up 300 horsepower in any car makes passing a slower car or closing up the gap between a couple corners on a winding road much simpler. Screaming past a ton of cars on the freeway in just a couple seconds is so easy, and almost too addictive. The 15-inch Brembo brakes hidden behind those big wheels are impressive. Hard stops to make a tight corner felt effortless and balanced. The pedal feedback was smooth, and wasn’t too grabby at lower speeds. I never thought the Mustang GT brakes were terrible, but these are a welcome upgrade. Now, the inside of a Ford isn’t the inside of a Mercedes-Benz, but thankfully VLF replaced the standard hide with more supple leather. Red would not be my first choice, but I get what they were going for. A tasteful application of carbon fiber trim pieces roam throughout the interior, and the standard infotainment and steering wheel controls remain. Fisker the designer went into new territory with the Karma, and he made the Rocket stand out as well. If you’re going to drop a hundred grand on a hopped-up Mustang, you’ll want to catch glances. This updated body, with its massive grille, big rear ducts, and tastefully integrated rear spoiler, will definitely get some stares. The styling isn’t going to please everyone, but why buy something that everyone else has if you’re into American pony cars? On the road, it’s not quite as inspiring, nor does it feel as thoroughly developed as it could have been. The car doesn’t communicate with the road as well as I expected. The larger wheels and wider P-Zero tires rubbed when I’d turn into a medium speed bend. The car could benefit from a set of slightly narrower Pirelli Trofeo R or Michelin Pilot Sport S4 (or Cup 2 if you really want to get grippy) tires. Suspension settings need some tweaking, but they’re on the right track. It feels as if they picked a good coilover setup and some sway bars off a shelf, bolted them up, and said “Send it!” The response on turn-in isn’t terrible, rebound is harsh, even on the highway. On the twisty roads, it became really unsettled if there was a hint of a bump near the apex. As I said, they’ve got something good to work with here, but it needs some focused adjustment. In a few different conditions, the engine felt like it was producing just something north of, say, 550 HP. I’ve driven plenty of 600+ HP cars, and the Rocket didn’t give me the sensation it was letting loose all 725. Maybe the weight still slowed it down—3,500 pounds are still a lot of pounds. I hoped the carbon panels would have made a huge difference, but that’s not the case. You definitely feel the weight transfer when you’re going through a corner too. And then there’s that price tag. A Mustang GT with all the options you’ll need (and plenty you don’t need) will max out around $50,000, and even getting a bunch of tuner shop upgrades won’t cost you $20,000. Carbon fiber body panels aren’t cheap, but some buyers considering this car won’t care as much about the 200 pounds dropped for that amount of cash. It’s just kind of disappointing to drive. Given all that went into this, it doesn’t have the handling chops or the inspirational experience that I think a buyer would expect, especially at this price tag. If you want the best Mustang money can buy, this isn’t quite it. You can visit your local Ford dealer, pick up a new GT350R for around $63,000, and you’ll have a more than capable canyon carver and track day toy. That car, with a 5.2-liter flat plane crank V8 that’s a love letter to the idea of internal combustion, is hard to beat at any price. If you want even more juice, you can spend a little bit more at your local shop and you’ll be packing 700 horsepower, east, and still be way below the price point of the limited-production VLF Rocket. There are plenty of great performance cars in the $100,000 range, and I’m just not the guy that will spend this much on what is, at the end of the day, still based on a Mustang. The thing is that VLF doesn’t have a problem selling this car. It’s not for me, but there are plenty of buyers paying deposits to get the Rocket made to their liking, and that’s what matters. It should appeal to people who want something special, eye-catching, unique and with some Grand Tour street cred—if you want this and you can afford it, no arguments about the GT350R will convince you otherwise. I merely wish the Rocket’s final steps for calibration and dynamics had gotten as much attention as its design. It has so much potential, but it didn’t follow through. But VLF is pretty clearly doing some interesting, crazy things, so I wouldn’t count out Bob Lutz and Henrik Fisker to make some stuff that will really blow our minds next.